Durotone ™ is manufactured in Germany and marketed worldwide. 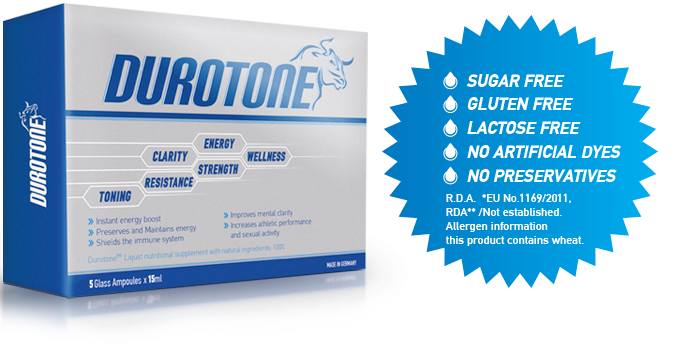 Durotone™ is one of the most popular and trusted energy boosting dietary supplements worldwide. Durotone ™ is made of certified natural ingredients sourced only from the EU. Instructions: Take a half 7.5ml or a whole ampoule of 15ml per day. Warnings: Keep at temperature below 25 degrees Celsius, keep away from children. Do not exceed the recommended dosage. The supplements should not be used as a substitute for a balanced diet. Pregnant or nursing women should consult their doctor before taking. DUROTONE ™ is manufactured in Germany for Medicare Europe Ltd. According to ISO: 9001: 2008 and GMP (Good Manufacturing Practice) standards controlled by the German Health Authorities. Effectively treats the symptoms of fatigue, muscular dystrophy and mental collapse. Significantly high therapeutic value in cases of depression and weakness. Helps in good mental function and corrects the balance of metabolism. Increases the ability to focus and work longer hours. Increases sexual activity as a natural tonic. Helps remove free radicals from the body. Alternatively can be used to stimulate the body during and after physical activity as a natural isotonic drink without preservatives and colours. A large percentage of people are complaining about “lack of energy” and stress. Both men and women tend to blame fatigue on a too-busy lifestyle due to the daily living conditions, stress, mental fatigue and vitamin deficiency. The constant self-doubt may propel individuals towards anxiety and depression because they feel as if they are never able to achieve success. When addressing these symptoms people are turning to nutritional supplements to restore the lost balance of the body and recover of mental and physical energy. Natural Ways to stimulate the body are the key to balance. Royal jelly consists proteins which provide all the essential amino acids for the proper functioning of the body, sugars in a fixed ratio similar to honey as well as water. But what characterizes the Royal jelly, as the treasure of nutrition, is its high amounts of B vitamins and the correct ratio of other nutrients and vitamins such as vitamin C, D, A, E, minerals (K, Ca, Na, Zn, Fe, Cu, and Mn) and a number of active substances. The combination of these ingredients make Royal Jelly a miraculous mixture that benefits particularly aching bodies giving energy, wellness physical strength and effectively treating the symptoms of fatigue, muscular dystrophy and mental collapse. Bee honey is one of the most valuable, nutritious super-foods giving energy to the muscles, clarity of mind and a number of beneficial properties for the human body. Its significantly high therapeutic value in cases of depression and weakness has been scientifically documented. Honey acts against fatigue, and this is achieved by storing the fructose, which is contained in the liver as glycogen, and there converted into glucose by increasing the content of the blood. This mechanism gives a direct and preserved energy making it a key element for the diet of athletes and gymnasts. It has been shown that using honey, improves athletic performance by prompting carbohydrates, improving strength in the same manner as the carbohydrate drinks or gels. The honey can be used alternatively for stimulating the body during and after physical activity as a natural isotonic beverage without preservatives and colours. Honey is a natural sweetener, easy to digest and loaded with nature’s goodness. The bee pollen is a product of the beehive that is scientifically verified to give valuable nutrients and features energizing properties. The bee pollen is the protein food of the bees and the basic food for their new born baby bee. It is an irreplaceable natural source of protein, amino acid, carotene, rutin (vitamin ii), enzymatic ingredients and plant hormones which are harmless to humans (unlike synthetic hormones). It includes a large amount of flavonoids and phenolic compounds that help remove free radicals from the body. The effects of the bee pollen yield surprising results, help mental function, correct the balance of metabolism, increase mental focus and the capacity to work longer hours and finally working against stress and increasing the sexual activity. The use of bee pollen enhances stamina and it is widely used as a natural tonic. The wheat germ is the living part of the wheat grain and contains all the necessary ingredients for its development. It is characterized as a super-power food for energy and vitality and contains 6-fatty acids, vitamin E and vitamin B12 making it irreplaceable. The wheat germ oil is a shield for the body that strengthens the immune system. Taurine is one of the most known sulphate amino acids. It is synthesized from cysteine and methionine in the presence of vitamin B6 and zinc. Located in food sources such as meat and fish, It has been scientifically proven to help in muscle recovery after exercise. Increased alcohol intake and diet low in dairy products and meat reduce levels of taurine in the human body. Taurine is often used as one of the key ingredients in popular energy drinks improving mental agility and increasing athletic performance.